How happy and engaged are our employees? It’s an important question that every business should want to know the answer to. We hate to break it to you, but according to our latest employee survey, 51% of employees are not happy at work. What does that mean for your business? The less happy and engaged your employees are, the less productive your business will be as a whole. Start focusing on how to make your employees more engaged for better business outcomes. Take at a look at the current state of employee engagement and see what you can do to make it better. 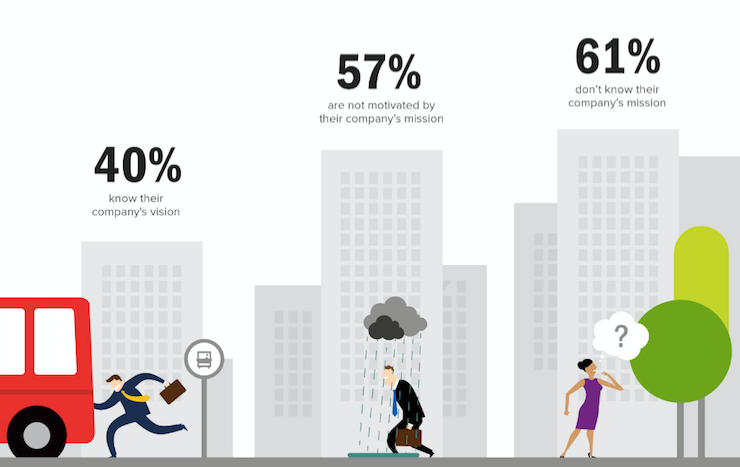 It’s surprising that a whopping 61% of employees don’t know their company’s mission. A mission and vision statement is essentially a summary of the aims, values and direction of your company. Knowing and embracing the company’s mission helps provide employees with a sense of purpose and with motivation to succeed. But if your employees aren’t aligned to, or even aware of, your company’s mission and vision, how can you expect them to move forward as a whole towards the same goals? Focus on your company’s mission and vision, and start strategizing on how to build more awareness of those core, guiding principles within your organization. Not only are a majority of employees unaware of their company’s mission and vision, but apparently they are also oblivious to their company’s cultural values. Values are important because they help define company culture and reflect what an organization ultimately cares about. You want your employees to embrace your company’s values because by having a personal and emotional connection to what they do, they gain a sense of importance and motivation behind their work. But as our research shows, shared culture can only go so far towards improving overall levels of engagement. We’ve all heard the saying, “People join companies, but leave bad managers.” One constant that remains as a contributing factor to employee disengagement is poor leadership. Only 45% of employees trust their company’s leadership and half don’t expect to be in their current job just one year from now. This represents an obvious disconnect between employees and their work, and especially between employees and leadership. According to a Careerbuilder.com study cited in a Wharton management blog, 76% of full-time workers, while not actively looking for a new job, would leave their current workplace if the right opportunity came along. Don’t lose great talent because of a lack of trust in leadership and in their vision for the future. Reassure your employees that your company and leadership team cares about them, as both workers and human beings. Put the emphasis on showing them respect and trust in what they do. Results clearly show that employees have a deep desire for employee recognition. A massive 93% hope to be recognized at least quarterly, if not more. Why is it important to recognize employees for their hard work? According to the Psychologically Healthy Workplace Program, employees who feel valued by their employer are 60% more likely to be motivated to do their very best at work. A quick recognition, whether from management or a peer, goes a long way and can boost employee engagement by up to 22%. Start recognizing and rewarding your employees for jobs well done and witness the positive impact it makes. Today’s rewards and recognition programs go way beyond tired old plaques and paperweights and should be based on a social media model to encourage the highest levels of adoption and active use. They should link to employees’ existing social networks and other common communications platforms like Slack and Jabber, offer point-based rewards so employees can choose items that are meaningful to them, and most importantly, they should serve to reinforce company values and encourage desired business results. To learn more, download The Greatness Gap: The State of Employee Disengagement.